Bronx, NY – After six innings of work, Yankees RHP Masahiro Tanaka was done for the night. In what I considered to be a well-balanced start, Tanaka threw 83 pitches (55 strikes), walked two batters, produced four strikeouts with no runs allowed. With the Yankees holding on to a 2-0 lead over the Giants in the top of the seventh inning, Yankees pitcher Dellin Betances had entered the game. Unfortunately for the Bronx Bombers, a wild pitch helped the Giants drive in a run. As a result, San Francisco are down 2-1. As fun as the action has been, the music tonight has been off the hook. Songs from Billy Idol, Tone Loc, Grandmaster Flash and Guns N Roses have made this night enjoyable. With less than three innings to go, can the Yankees hold on for the win? With that said, I’m going to plug the New York International Salsa Congress. 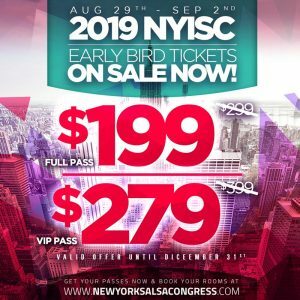 New York – The New York International Salsa Congress (#NYISC2016), a multi-day Latin music and dance festival, celebrates its 16th anniversary with over 8,000 attendees from around the world at The New York Marriott Marquis in Times Square from Thursday, September 1, 2016 to Sunday, September 5, 2016 with an official kick off party held at Haus NYC in Tribeca on Wednesday, August 31, 2016, presented by Goya Foods and sponsored by Festival People en Español. Goya Foods, the largest Hispanic-owned food company in the United States and celebrating its 80th anniversary, will be the presenting sponsor of this year’s festival. Each year the #NYISC2016 brings together people of all cultures, ages and backgrounds to participate in this multi-day celebration of Latin music and dance. From novice to professional dancers, the festival attracts people from all walks of life to establish a sense of community, to gain exposure to different styles of dance and to achieve a higher level of knowledge and expression while sharing the true passion for Latin music and dance. Attendees will have the opportunity to choose from over 60 instructional dance workshops, view a fantastic showcase of professional dance performances and competitions, and dance all night to a LIVE concert series with Jimmy Bosch and vocals by sonero Hermán Olivera “El Sonero del Siglo XXI” (Friday, September 2), Fania legends ADALBERTO SANTIAGO (Saturday, September 3), and the one and only Roberto Roena (Sunday, September 4). For more information, go to NewYorkSalsaCongress.com.